Facebook is a company in a hurry. Since the world learned about the latest customer data controversy at Facebook, the social media network has unleashed a swarm of changes. But it’s unclear whether Facebook’s own reckoning will be enough to satisfy regulators and lawmakers. 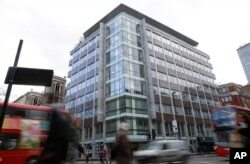 With more than 2 billion customers, Facebook has been in the hot seat in recent weeks over how an outside researcher gave the data of 50 million users to the political research firm Cambridge Analytica. What if anything Cambridge Analytica has done with the data is unclear — the company claims it deleted it. But the situation has shone a spotlight on how much personal data is available on Facebook and how it is handled. Sonos, a consumer electronics firm, Pep Boys, an auto parts and service retailer, Mozilla, the maker of the Firefox web browser, all stopped advertising on Facebook in response to the controversy. “We would like to see a bit more transparency to the consumer and a bit more choice to the consumer,” said Denelle Dixon, chief operating officer at Mozilla. FILE - Facebook CEO Mark Zuckerberg meets with a group of entrepreneurs and innovators in St. Louis, MO. In a Facebook post and an appearance on CNN, Facebook CEO Mark Zuckerberg apologized for the controversy and vowed to do more to protect user data. “This was a major breach of trust, and I’m really sorry that this happened,” he said. 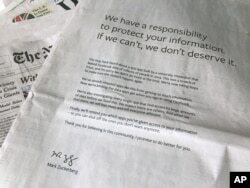 The company also placed ads in Britain and the U.S. apologizing for a "breach of trust." An advertisement in The New York Times is displayed on March 25, 2018, in New York. Facebook’s CEO has apologized for the Cambridge Analytica scandal with ads in multiple U.S. and British newspapers. As state and federal regulators opened investigations and several congressional committees called on Zuckerberg to testify, Facebook has been busy rolling out changes. The company made it easier for users to change privacy settings and has given them a quick way to download all the data that Facebook has on them. It has also cut off major data brokers. Facebook may know soon whether its efforts will be enough. Silicon Valley firms have long held that self-regulation, rather than government-imposed rules and regulations, would best allow for innovation. But the company also faces a bevy of state, federal and international regulators, which all may act against the firm. In the U.S., Facebook’s chief concern is the Federal Trade Commission, which confirmed last month that it had opened an investigation into the company’s practices. A key question will be if Facebook violated a 2011 consent decree it has with the consumer protection agency to obtain users’ permissions for everything it does with users’ data. Each violation is supposed to come with a $40,000 fine, which some analysts have speculated could cost Facebook billions. In addition to the FTC, several state attorneys general have opened up an investigation into Facebook. Beyond regulators, lawmakers in Washington and in state houses around the country are discussing what can be done to better protect social media customers. Zuckerberg is expected to testify in front of the Senate Judiciary Committee next week. Meanwhile, the company faces possible investigations in Britain and Canada. It is not just Facebook that deserves more scrutiny but all of the “advertising-powered web,” said Gennie Gebhart, a researcher with the Electronic Frontier Foundation, a digital civil liberties organization. Rotenberg of EPIC said governments around the world shouldn’t leave it to U.S. and European regulators and lawmakers to regulate social media and user privacy.